Due to a wide range of variables, there is no standard life expectancy for a lawn mower; like virtually all engine-powered machines, each mower has a slightly different lifespan. Mower life expectancy isn't a total crap shoot, however. As the owner, you exert influence on your mower's longevity. Treat your mower as an investment; take care of your mower, and it will reward you with reliable operation and a longer lifespan. Man cutting grass with an electric lawn mower. The marketing information-services company J.D. 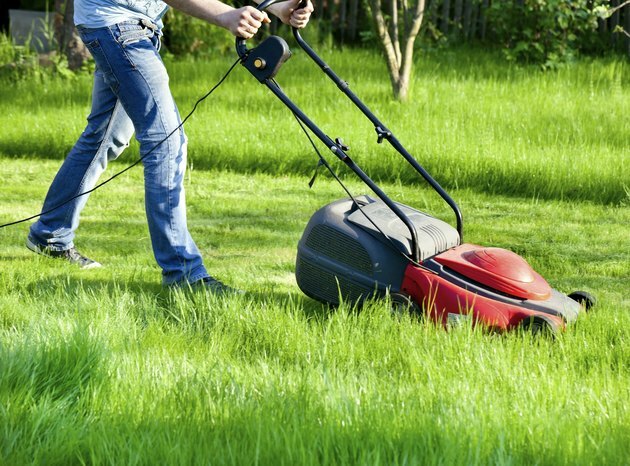 Power and Associates reports that the average lifespan of a lawn mower ranges between seven and 10 years. The same report says that consumers spend an average of about $300 for a walk-behind mower, meaning the average mower gives a year of life for every $30 to $43 spent, depending on the model. Manufacturers estimate the predicted lifespan of robotic lawn mowers at eight to 10 years. Brand, usage and upkeep all exert sizable influence on the life expectancy of a lawn mower. Most mowers employ a side- or overhead-valve engine, which caters to short-run applications. Power product manufacturer Generac estimates that the typical side- or overhead-valve engine will reach the end of its expected 10-year lifespan after about 240 hours of use, or one hour per week for six months out of the year for 10 years. Regular maintenance goes a long way toward extending your lawn mower's life expectancy. Each season, clean or replace the mower's spark plugs, lubricate its engine, replace its air filters and sharpen or replace its blades. Clean the mower's underside with a water hose after each use. Keep all fasteners tight and oil at manufacturer-recommended levels. Add oil to the gasoline for two-cycle engine mowers but never mix oil and gas in a four-cycle engine. Follow your mower's instruction manual when performing maintenance procedures. Before shopping for a mower, do your research: Read online reviews, consider your yard-work requirements and enlist sales associates to help you select the best mower for your yard. Choosing the best mower for your individual situation often leads to a longer-lasting investment. For instance, small yards call for a push mower, while self-propelled mowers cater to medium-sized yards. Battery-powered mowers work in small yards but may encounter trouble in dense grass. To extend your mower's life expectancy, choose an engine with at least 5 horsepower for hilly or dense yards.